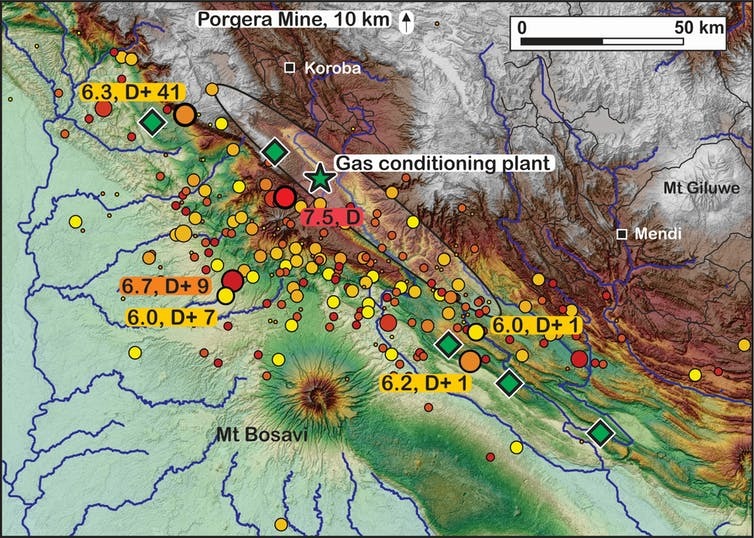 Distribution of the aftershocks magnitude 4+ since the main quake (as of April 9, 2018). The size and colour (small to large, yellow to red) indicate aftershock magnitude and D+ the number of days after main shock. The white shaded ellipse represents the area of greatest slip during the main shock. Green diamonds represent the main gas fields. USGS/Gilles Brocard, Author providedIt is this tectonic activity that determines the delicate interplay of economic benefits from raw materials, and the often-devastating and usually-unpredictable effects of natural disasters on society. You can read the full article here at this link.